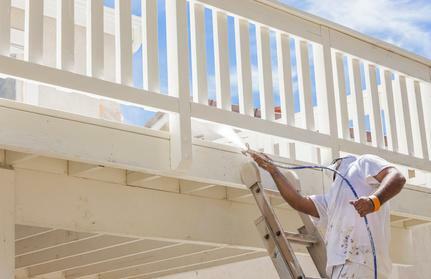 Royal Painting has many years of experience in applying stain to decks, fences and railings. As with all of our painting and staining work surface preparation is extremely important, we normally power rinse decks after cleaning and stripping and prior to preparing surfaces for sealing and staining. Excess pressure when power washing wood can cause damage, different types of wood require different amounts of pressure. Our workers are skilled in power washing wood surfaces, operating our equipment and are familiar with the correct pressure to use on various types of wood. There are three basic types of stain that we apply. Transparent: Clear finishes are formulated to allow the wood to wear naturally while having the benefit of maintaining the woods natural colors and tones. Clear finishes add the least amount of color when compared to semi-transparent and solid stains. They bring out the natural beauty in woods such as Cedar and Redwood. Semi-transparent: Semi transparant stains are designed to protect your wood without completely obscuring the natural color and texture, these offer better protection from the suns UV rays than transparent stains. A wide range of finishes are available, cedar, gray, redwood, etc.. Solid color: Solid color stains offer the best protection from the suns damaging UV rays. However, solid stains will completely mask the wood grain, while allowing the wood texture to show through. Our deck staining and sealing process is very thorough The surface is scrubbed with a cleaner and/or a Deck Stripper to soften the previous deck sealer or deck stain. The surface is power rinsed with a power washer. Any required filling, power sanding or timber replacemet is then carried out. Sealer or stain is then applied. Customer notes Our power-washers are gas powered, we will require access to a cold water supply. We will require a 120v electrical supply for power sanders, power saws etc… Remove any delicate items, plants or furniure which could be damaged by water. Ensure windows are closed and notify the crew manager and/or paint crew of any areas where water may enter the house. Debris will be cleaned up by our crew prior to job completion.